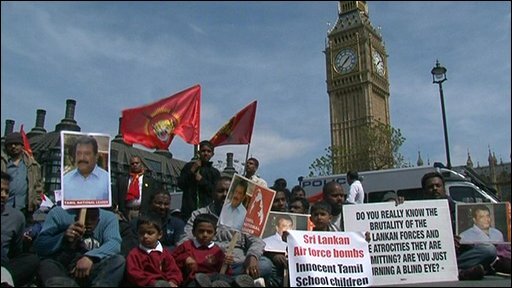 About 500 protesters calling for a ceasefire in Sri Lanka have blocked roads outside the Houses of Parliament. Police said the demonstrators had spilled through police lines and taken to the streets in Westminster. Protesters, including hunger strikers, have been camped in Parliament Square since early April. The United Nations has described the situation in northern Sri Lanka as a "bloodbath" after reports of heavy civilian casualties at the weekend. Police closed the approaches to Parliament Square from Westminster Bridge and Whitehall and blocked the protesters in with vans. The main entrance to the Houses of Parliament was also closed off, to prevent the crowd surging towards the Commons through the Carriage Gates. A Metropolitan Police spokesman said: "At about 10.30am today about 500 protesters in Parliament Square pushed through police lines across the road towards the Palace of Westminster. "The protesters are now sitting in the road between Parliament Square and Whitehall. Police are currently negotiating with the demonstrators to get them back into Parliament Square." The demonstration was described as noisy but peaceful, with chants urging a ceasefire in Sri Lanka. More than 100 children died during the "large-scale killing of civilians" in Sri Lanka over the weekend, UN spokesman in Colombo Gordon Weiss said. One doctor working in the war zone said at least 378 people were killed by shelling. The army denied shelling the designated "safe zone" for civilians. Police said 3,000 protesters had taken to the streets of London during the initial demonstrations at the beginning of April. Representatives of the protesters met Foreign Secretary David Miliband last week to urge him to do more to end the fighting.